ADVANCED DESIGN LIFTS GRASS, CUTS IT CLEAN. With Deutz-Allis free-floating anti-scalp mowers, you'll get superior mowing even under difficult conditions. Decks are extra deep, allowing greater air flow for better discharge of clippings. Mowers mount to the pivoting front axle, so they follow ground contours closely. Rollers underneath and across the rear even out bumps and dips to lessen the likelihood of scalping. And Deutz-Allis mower blades are the best on any lawn tractor. They're specially hardened and balanced to cut smoother, cleaner, longer. 1. Front-axle-mounted mower pivots side-to-side, up-and-down to follow contours of your lawn to give a smooth cut, even over rough terrain. Multiple cutting heights, that easily adjust without tools, allow you to match height to grass conditions throughout the mowing season. The patented "Quick Hitch" mounting system allows for quick seasonal changeovers or maintenance checks. 2. Twelve-gauge all-steel mower decks resist the twisting and warping common to lighter gauge decks. Ensure that blade heights remain consistent for a smooth, level cut every time. Mower decks are available in 1, 2 and 3-blade designs, in cutting widths from 30" to 60". 3. The heavy-duty cutting capabilities of the blade are supported by steel, splined arbor shafts which eliminate play between moving parts. The arbor shaft spins freely in an enclosed housing between two sealed ball bearings. With this low maintenance, long-life design, you can be confident of top performance. 4. Heavy austempered steel mower blades resist shattering and hold a sharp cutting edge longer to give the healthy, clean cut your lawn needs. All blades are carefully balanced to minimize vibration and meet all ANSI specifications. Note: 60" Ultima deck has a counter-rotating discharge blade for better cut and dispersal. 5. Aerodynamic baffling and deflector system stands up blades of grass for level cutting and even dispersal of clippings. Gives you the well-groomed lawn your neighbors will envy. If you choose to collect clippings, efficient grass catcher attachments are available. Also, power-driven vacuum systems fit many models. 6. Full-width rear rollers on all models allow the mower to follow uneven turf to resist scalping. Rollers are strategically placed on each mower to offer anti-scalping performance. Cutting height is easily adjusted to multiple settings: Unique system provides simultaneous adjustment of both front and rear of deck. A. Mounted to pivoting front axle to allow up and down, side to side flotation. B. Heavy 12-guage steel construction resists twisting. C. Center anti-Scalp rollers on wider decks guard against scalping. D. Strategically placed rear guide rollers follow uneven terrain. E. Multiple cutting heights adjust front and rear simultaneously. F. For extra life, blades are supported by steel arbor shafts with sealed ball bearings. G. Austempered steel blades are precision balanced to stay sharp longer. H. Aerodynamic baffling and wind tunnel design stands grass straight up for clean cut. I. Deep deck design assures good mowing performance even in difficult conditions. J. 1, 2, or 3 overlapping blades provide streak-free mowing. K. High RPM blade action lifts and discharges clippings evenly. New Deck-Mounted Vac Blower makes grass collection easy and economical. Now you can save time and money with our new Deck-Mounted Vac Blower. This innovative, inexpensive unit slips easily onto the discharge side of the mower deck on Vanguard, 600, T800 and 1900 Series tractors. It's belt-powered, directly off the drive system. No separate PTO-power or engine power is needed. The new Deck-Vac efficiently handles grass, leaves and other clippings. And the Deck-Vac saves you money because it can be used with our economical twin grass catcher or cart collector. Choose from a variety of efficient grass collection systems. 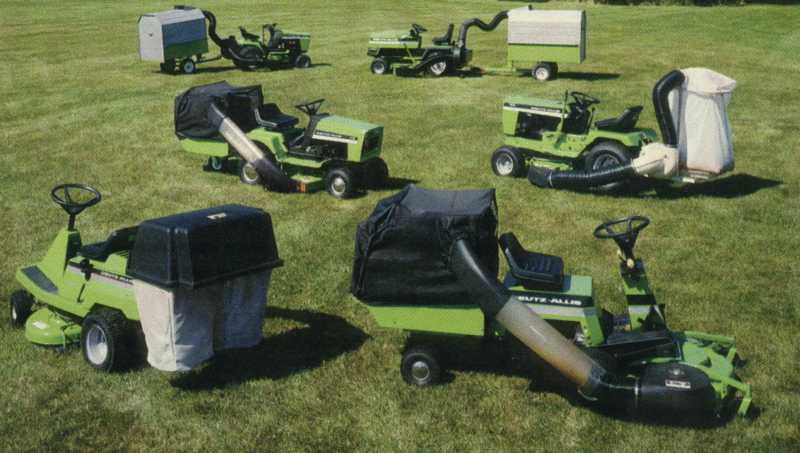 All Deutz-Allis riding mowers give you a choice of collection systems. 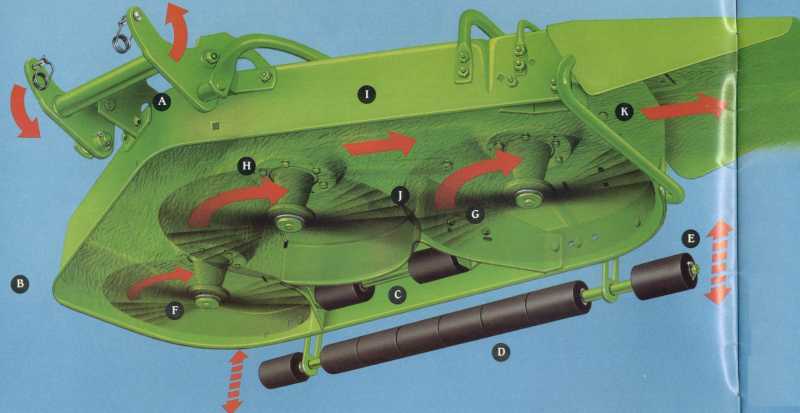 Depending upon your model, you might choose a twin grass catcher, cart collector or hopper system. We also give you a selection of power sources, including Deck-Vac, engine vac or PTO-driven. Capacities range up to 50 bushels.